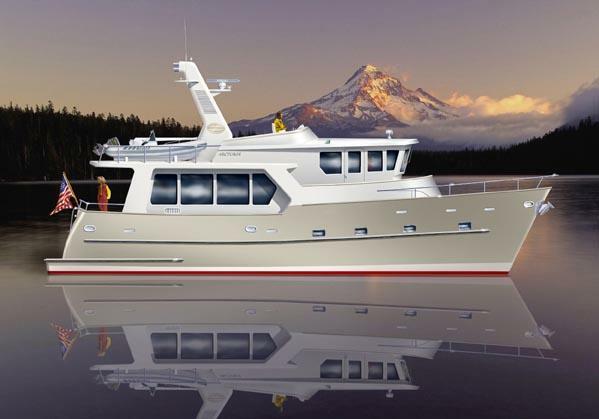 Boat Description The Arcturos 50 by Taylor Bay Yachts is your home on the water. From the flybridge, with its full helm instrumentation and generous lounge seating, you and your guests will enjoy nature`s panorama as you cruise smoothly and comfortably through the water. Taylor Bay Yachts has gone to great lengths to insulate and isolate sound and vibration with the latest technologies, including our active stabilizers, to make your long voyages more relaxing and pleasurable. Upon entering the saloon, you are immediately taken in by the natural satin finished American cherrywood saloon tables and cabinets, the galley cabinetry, the desk, and wet bar. In the pilothouse, your guests will relax in comfort on the L-shaped observation settee while you and your first mate control the ever agile Arcturos 50 from your Command Center. The master stateroom boasts an ensuite head with its home-style toilet, cherrywood vanity, linen closet, spacious shower, queen-size bed with built-in, periscoping, LCD television. The custom made vanity/desk, chest-of-drawers, nightstands, bookcases, and wardrobe closet are a true reflection of the craftsmanship that distinguishes the Arcturos 50 from others in its class. The VIP guest stateroom boasts an ensuite head with home-style toilet, shower and cherrywood vanity, queen bed, built-in dresser, LCD television, and washer/dryer. Both staterooms abound with an intelligent and efficient use of all available space. Large built-in drawers are found beneath each of the queen-size beds. The foot of each bed is fitted with an electric ram, making them easy to lift with just the press of a button, opening up to cavernous space for long-term storage. Deck 1) Teak Deck: Optional 2) Trim: Rails around fore deck, fly bridge, sun deck, walks to be polished marine grade aluminum 1 1/4` diameter 3) All horizontal surfaces on deck coated with non-skid application in final paint process -- Non-skid to slightly darker shade than parameter deck 4) Chocks for mooring lines: Transom: Polished marine grade aluminum schedule 80 --Transom sides: Polished marine grade aluminum schedule 80 --Amidship: Polished marine grade aluminum schedule 80 --Bow: Polished marine grade aluminum schedule 80 5) Rub rail: - 4` half round polished schedule 80 marine grade aluminum integral to the hull -- Lower rub rail: 4` half round polished schedule 80 marine grade aluminum integral to the hull 6) Polished aluminum ports in hull as shown on design and build with double laminate of safety glass - ports to be opening 7) Bow roller to accommodate a 110 lb and 60 lb CQR anchors on starboard and port rollers, respectively. Both to be slotted for chain. Bollard behind windless polished schedule 80 marine grade aluminum. 8) Polished aluminum stem plate below bow roller 9) Reinforced base to accommodate Maxell 3500 windless -- Port and Starboard aft winches and amidship winch 12 DC electric with 400 lbs pull. 10) Lewmar # 39640050 hatch on wheel house 11) 2 - Deck hatch in house forward Lewmar #39660050 12) Windshield wiper: 2 - Vetus Pantograph 13) Horns: air horn Kahlenberg Model T-OA, 3-5835 14) Wheel house windows: Safety glass windows tempered glass. Front glass forward facing to be 1/2` thick. Side glass to be tempered 3/8` thick. -- All windows to be Diamond Sea Glaze 15) Saloon windows: Safety glass partial opening, tinted and 3/8` thick. 16) Wheel house doors: Diamond Sea Glaze aluminum Dutch doors with window in upper opening section. 17) Saloon door: Diamond Sea Glaze non-sliding door 18) Transom and starboard amidships doors opening inboard. Electrical 1) Electrical Panel: Electrical Panel AC/DC -- 1 parallel solenoid -- Engine emergency shut off switch and panel -- Windless emergency shut-off switch and panel -- Inverter - Outback 5600 watt with voltage/ampage control module and 130 amp batter charger 2) Shorepower inlet: 1 - Marinco 6344EL-B 50 amp 2 pole 3 wrie -- 1 - Marinco 6343EL-B 50 amp 3 pole 4 wire -- 2 - Marinco 6304EL-B 30 amp 2 pole 3 wore -- 1 - Marinco TV/Phone Inlet PH6444TV 3) Battery and FRP Battery Box -- 6 - 340 AH (8L16) House Batteries. 1 - 8D engine starting battery. -- The engine starting battery is isolated from the house batteries to prevent the inadvertent discharge of the engine starting battery. -- 1 - group 31 starting batteries. The genset starting batteries are isolated from the house batteries and engine starting batteries to prevent inadvertent discharge of the genset starting batteries -- Each battery is contained with a large premium battery box with cover and thoroughly secured with tie down brackets -- Top of each battery box to be clearly labeled indicating battery`s use. 4) Battery Cable: to be 2AWG, positive lead to be red, negative lead to be black 5) All wiring used throughout the boat to be color coded per ABYC standards. 6) Conduits for future installations: PVC from radar arch to pilothouse -- PVC from engine room to pilothouse 7) Conduits for AC/DC -- PVC along bulkheads for AC -- PVC along bulkheads for DC 8) Electrolytic control -- Electrolytic control to be installed per ABYC standards for an aluminum boat. 9) AC generator -- 12 KW 120/240 AC Northern Lights generator in sound shield and Gen-Sep/Verna lift system. Engine Mechanical 1) 2 - ZFW 220 3.00 to 1.00 Tranmission -- 2 - 1 x 12 volt 270 amp Leese Neville model no 4864JB large case alternator to charge house batteries. -- 2 - 1 x12 volt 35 amp small case alternator to charge starting battery -- 2 - SAE `A` Hydraulic pump drive, PTO -- 2 - Engine instrument panel: Deluxe with instrumentation for oil presure, water temperature -- voltage, revloution and hour meters with alarms -- 2 - Engine control levers Morse Teleflex model -- 2 - Control cables to be Morse Teleflex length to suit 2) 2 - Propeller shaft: 2 1/4 Aquamet 17 -- Taper details: Standard SAE taper 3) 2 - Propellers: 4 bladed bronze, 34` diameter x 32` pitch port and starboard rotation 4) 2 - Stern Tube: Aluminum marine Grade 5086 -- Bearings: Rubber cutlass tube at aft end -- Stuffing Box: Drippless 5) Fuel Filters: 2 - Duplex 75-900 - Racor #75-900FGX2 plus engine mounted filters -- Fuel polishing filters: 2 - Gulf Coast Filters F-1 6) Dry Exhaust: 2 - 4` dia. Stainless steel 7) Engine Room Blowers 2x Dayton #2C646 8) Engine Room doors from lazarette and owner`s cabin to engine room to be water-tight with window 9) Aluminum railing around engines. 10) Wesmar hydrualic stablizers: 7.5 square feet 11) Wesmar hydrualic bow thruster: 10 HP 12) Hydraulic windless sized for ground tackle. Galley Refrigerator: Sub-Zero Model 770 TC -- Countertops: Granite --Flooring: Cherrywood -- Cabinetry/paneling: Cherry wood with a satin finish and push button latches -- Stove: GE electric model -- Microwave: GE convection microwave -- Dishwasher: GE model -- Garbage Compactor: GE -- Overhead: Individual padded panels secured in place with VELCRO and easily removable for service -- Locker interior finish: finished cherrywood. The legislation on shoreline use brought up for debate in the Greek Parliament has triggered strong reactions from environmental groups and opposition parties.